This papaya smoothie gives you that tropical taste, while also providing amazing healing power and other health benefits! This summer I had a pretty bad fall off my bike. Of course, it was my fault, I was doing something stupid by trying to talk on my cell phone while riding. After getting over the initial shock of falling, I cleaned up my surface scrapes and thought I was fine. But after about a week, I noticed a strange bump developing. I was concerned so I went to see a doctor. The doctor at the quick care explained that my fall caused some internal bleeding, the blood accumulated in one spot and caused an internal bruise. Then, to my surprise, he proceeded to his “prescription”: apply a warm washcloth and then either take papaya enzymes or eat fresh papaya. That’s right, my doctor prescribed me fruit to heal my injury! This was the first homeopathic recommendation I had received from a mainstream doctor, so I was curious. To heal my injury, I had the choice of eating taking papaya enzyme pills or fresh papaya. Since I'm not a big fan of pills, I opted to go the fresh, natural route. So how did end up healing my bruise? With a papaya smoothie, of course! 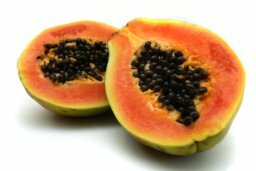 Papaya enzymes promote healing. You can buy a papaya enzyme supplement, which you can also take after meals to help digestion. Or get the same enzymes in fresh papaya fruit. Strawberries are loaded with healthy antioxidants. And you can’t beat the natural sweetness of this fruit. It's probably one of my top 3 favorite fruits. Peaches have lots of Vitamin A, which helps eyesight. This is important for all you avid TV fans, internet surfers and book worms out there. And aren’t we all these days? *Be especially generous with the strawberries on this recipe. It makes the smoothie really sweet, and balances out the strong flavors of the tropical fruits. Be sure to visit the How to Make a Smoothie section of the site for some general tips on how to make a smoothie. 1. Start by rinsing the papaya and then peeling it. Use a vegetable peeler or paring knife for this. Remove the seeds and cut it into small chunks. 2. Wash the strawberries and cut off the stems. You can also cut them in half, but that’s not necessary. I usually just toss them in whole to save time, especially if they’re small. 3. Rinse the peach, cut it in half and then into small cubes. Remove the pit. 5. Add the liquid. This recipe calls for almond milk, but you can easily substitute water or any other liquid smoothie ingredients and it will still be really good. 6. Blend for about 10 seconds until the fruit gets swept up and it becomes one big liquid. 7. Then add the ice. Add this point it will be really easy to blend instead of adding the ice with the other solid ingredients at the beginning. This is especially important if you don’t have a high-powered blender. Blend for about 30 more seconds. 8. Taste test a little bit of the papaya smoothie with a spoon. How's the texture? Does it need more ice, or more liquid? Or maybe it just needs to be blended for longer. Make this papaya smoothie your own by experimenting and tweaking as necessary. 9. Pour it into a glass, and enjoy your delicious frozen papaya drink! That’s it! In 10 easy steps or less, you have a refreshing frozen drink you can enjoy at any time of year. This smoothie tastes so good you won’t believe you’re giving your body crucial nutrients, but the best part is that you are! We can all use a little healing at times, even if you’re not healing a specific injury but just the stresses of everyday life. Healthy eating doesn’t have to be a chore, and you don’t have to feel like you’re on a “diet” or depriving yourself. It can be fun and delicious with smoothies! Be sure you let everyone know what you thought of this papaya smoothie recipe or if you made any adjustments.